Spacious two story house with little maintenance. Great location with Publix and several restaurants right across the street. With over 2752 square feet under air (5610 total), this 4BR/3BA/2-car garage home on an oversized lot features a 14x20 bonus room, 11x19 kitchen, 15x18 master BR, 20' ceiling in living room, huge master bath with garden tub and more! 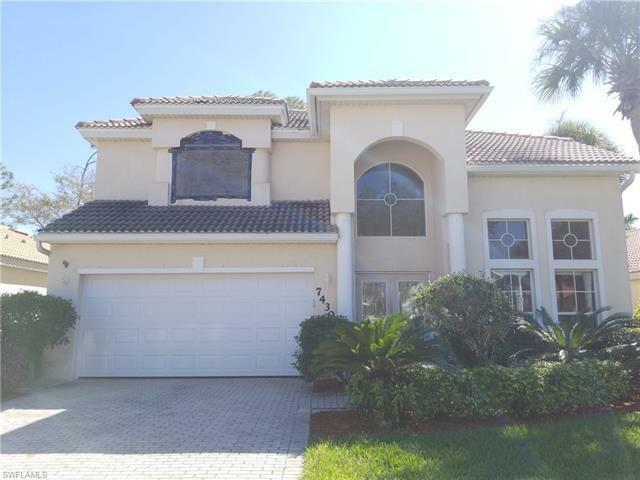 This home has a huge den/study and is located in a great gated community. Upgrades include custom made French doors at entry, paver driveway, raised panel cabinets (real wood), Corian countertops, custom sink & faucet, glass-top range, upgraded tile & carpet, tiled walls in baths, additional phone & cable jacks, laundry tub, much more. Downstairs BR/BA can be made into a guest suite. The low homeowner fee includes lawn maintenance, cable TV, monitored alarm system, irrigation, ext. pest control and more. The community has a pool, spa, clubhouse (billiards, exercise room, game room), tennis, child play area, sidewalks, street lights and more. Gated community with an entrance on to 2 main roads. Walk to shopping, 10 minutes to the beach, 30 minutes to the intl. airport in Ft Myers.